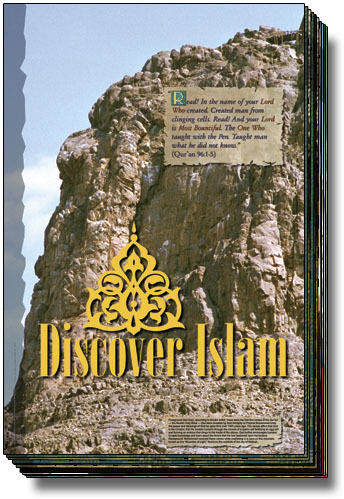 We invite you to experience the Discover Islam Poster Exhibits! Each poster masterfully integrates traditional Islamic art and calligraphy with modern computer graphics. The collections range from simple arabesque patterns to full color photographs of Muslims and the Islamic World. They powerfully communicate the beauty of Islam, and yet are gentle enough to sway any heart, Muslim and non-Muslim. Please click on the images below view the collections.